Enchanted Elephants Activity Gym is rated 4.8 out of 5 by 13. Dimension (in) 36" x 24.5" x 18"
Rated 5 out of 5 by Whitney85 from Super cute!! This mat is perfect for boys or girls & a great neutral look. My baby boy loves the bird that sings & lights up! Rated 5 out of 5 by Blc743s from Fun Product I got this a couple of months ago. I love it. It is beautiful and comfortable for my baby. My son loves yo play while laying o. It. My friends are jealous. Rated 5 out of 5 by Steponme413 from So soft and cute! I am loving this activity gym already - even though I am expecting and baby isn't able to test yet :) Packaging is very nice and very aesthetically pleasing. The cute elephant caught my attention first off, and the mat is just as soft and plush as I thought it would be from first look. Assembly was a breeze and love the toys and color palette, so I am super excited to have baby grow with this play mat. Rated 4 out of 5 by LizaS from Very comfortable! I received this in the mail and as soon as I opened the box I knew I would love it. It is pretty big but very comfortable with lots of padding provided for baby to lay on the floor; whether it be hardwood (which I have) or carpet. 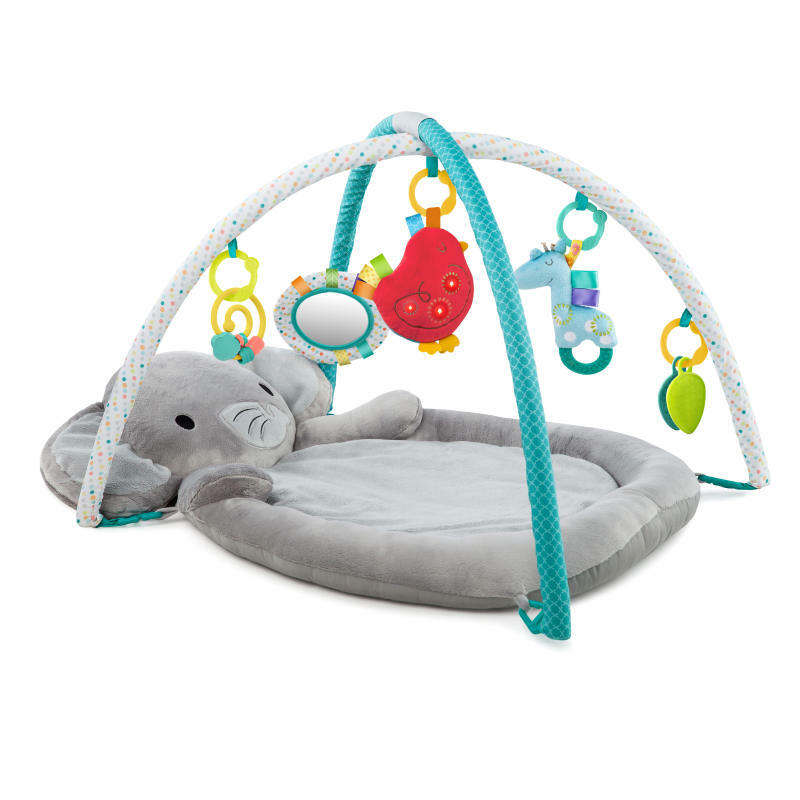 The colors are great and provide plenty of stimulation for baby. Very cute! Something I will definitley use in a month when baby arrives!